VolvoxLabs, in partnership with Bing, set out to build a unique community lounge and event space for Digital DUMBO that merged architectural design and aesthetically integrating audiovisual elements with functionality. VVox created a fully integrated, personalized visual system built from the ground up that included a projection mapped bar, user-based interactive LED walls, and a realtime social media interface that pulls in Twitter and Instagram feeds. This whole system is situated within a functional and modular interior design. The result is a seamless and highly personalized space perfectly tailored to individual or client needs. – A groundbreaking A/V system that seamlessly merges with the architectural design. – 200″ projection screen that allow for engaging presentations and visual content as well as a direct connection between Windows 8, Xbox and Airstream operating systems. – A custom made touchscreen interface that allows clients to control lighting, A/V content and Instagram + Twitter feeds in realtime. – Integrated technologies allow for the content to be presented simultaneously across all screens. 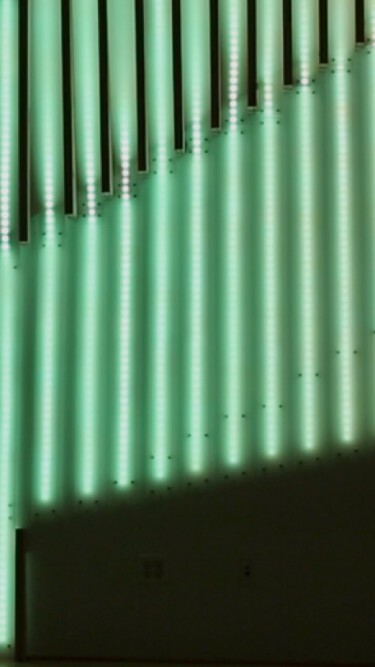 – 70 high-powered LED strips react to human presence, triggering patterns and surround sound effects using the Kinect sensors. Fast Company :: Is the Future of NYC Coworking?